With increased societal polarization, especially political, where people are bombarded with "facts" and opinions by pundits and experts, too many people choose to blindly follow their pundit of choice like rats following the Pied Pipers, without really thinking and questioning. I've felt that if more people were exposed to critical thinking principles, they might at least be able to identify when statements, opinions and actions aren't completely rational. This video is about teaching some very basic critical thinking standards with the intent to intrigue the viewer enough about critical thinking to learn more about the subject. Exploring the changing expectations of our students. Go to http://www.boxoftricks.net to read more about the effective use of technology in the classroom. In 2006, the MacArthur Foundation launched the digital media and learning initiative. Learn more at http://www.macfound.org/programs/learning. ntroducing Handwrite, a fun and easy new way to search Google from your smartphone or tablet. To enable Handwrite, visit www.google.com on your smartphone or tablet, click 'Settings,' found at the bottom of the page, and then enable Handwrite. This feature is currently available in 27 languages. Watch and share "A Day Made of Glass 2: Unpacked," to see how Corning's highly engineered glass, with companion technologies, will help shape our world. Take a journey with our narrator for details on these technologies, answers to your questions, and to learn about what's possible -- and what's not -- in the near future. The world's most advanced desktop operating system gets even better. And makes the Mac, iPad and iPhone work even better together. We take a look at three workflows that could be applied to many challenges organizations encounter in this emerging space. As significant portions of these workflows are not possible with mobile device management solutions, these example cases explore a more rounded approach to automating iOS management. On March 28, 2012, we hosted a product launch event for Casper Suite 8.5. Entitled "Everything Apple, Managed" we focused on education - specifically the amazing, new possibilities that eBooks make possible. JAMF Software has a long history of helping educational organizations succeed with Apple technologies and we're well-known for our dedicated goal of supporting the Apple platform. That we are not instinctively built that way must be recognized if we're going to get beyond the risks of not being built that way, says David Ropeik. Ropeik an Instructor at Harvard, a consultant in risk perception and risk communication, author of How Risky Is it, Really? Why Our Fears Don't Always Match the Facts, and principal co-author of RISK, A Practical Guide for Deciding What's Really Safe and What's Really Dangerous in the World Around You. PBL - This is a good project to show higher level thinking and implements strategies used in the real world. Student of the day and how to engage students in reading and writing. Any time we can get students to write a read it is a good thing as this ties into all other areas of education. If you don't want to carry a work phone and a personal mobile device Vmware is releasing Vmware switch that allows you to virtulize your phone in to multiple devices. There is research that show that student peer groups make an impact on student learning. So what role would this technology play in getting help to students that need it in a timely manner. Here is a video that you will help administrators to find out what is happening if a user has an issue with there Gmail account. Meet Zitsi Mirakhur from the University of Chicago. The beginning of her Teach for America assignment was rough...until Zitsi learned a few tricks of the trade. By the end of her first year, teaching had taught her a lot about herself. How'd she turn it all around? Follow 7 Teach for America recruits through their first two years on the job in New Orleans. Watch the full series here: http://bit.ly/6Vca9G. We learn a lot of lessons early in life that help us in our careers, but when it comes to your cloud data center's power allocation, sometimes you need something better than a rule of thumb or guesswork. That's where the Intel® Xeon® processor come to the rescue, with Intel® Data Center Manager and Intel® Node Manager. They're the accurate and efficient ways to manage your cloud workloads, without any pesky VM stifling. Watch how you can rely on policy, not estimates, when you design your cloud data center's power infrastructure! This year marks the 10th anniversary of Research@Intel. In celebration, Intel asked ten 10-year-olds to share their hopes for how technology will improve their lives ten years from now. Hear what these future consumers of Intel Labs inspired technologies have to say. Quote by Sally Ride ~ " All adventures, especially into new territory, are scary." Information on the Death of Sally Ride, my your journey to the unknown not be a scary journey for you Sally Ride. By connecting education with smarter technology, Intel offers a look into the future of K-12 education. Watch as students use technology to collaborate with peers and industry experts to build a bridge model, from the initial design phase through the final structure testing. Intel's education solutions help teachers provide innovative, personalized and secure learning environments to prepare students for successful futures in the 21st century. Here is an article wrote by Dr. Rod Rock. I think he and his community have developed a model for where we need to take our educational system to be able to compete on a global scale in to the future. Well said DR. Rock. You are truly making a difference in this world one student at a time. I think it could be a TED.org Talk Dr. Rock. November 30, 2011 - The Clarkston Community Schools' learner profile reads"Clarkston Community Schools' students are thoughtful, contributing members of society who possess the behaviors, skills and attitudes to continue to learn and adapt to a diverse and dynamic global society. Our curious and imaginative students exhibit critical thinking and problem solving skills, are effective oral and written communicators, and can access and analyze information. Clarkston Community Schools' learners, as successful 21st Century citizens, effectively use technology. They nimbly apply these skills throughout life in academic, social, and emotional situations." One of my goals as the superintendent of schools is to, by 2014, ensure that every building in the district is equipped to allow every student to use a 1:1 technology device to enhance his/her learning. Further, it is my goal next school year to have one building in the district that is equipped to allow for every student in that building to use a 1:1 technology device to enhance their learning. 1. In 2006, Thomas Friedman wrote in his book, The World is Flat: A Brief History of the 21st Century, that (paraphrasing): Any job—blue or white collar—that can be broken down into a routine and transformed into bits and bytes can now be exported to other countries where there is a rapidly increasing number of highly educated 'knowledge workers' who will work for a small fraction of the salary of a comparable American worker. And it seems that this prediction is moving toward the truth in 2011. 2. Beyond school (e.g., in the workplace, college, life) much (if not most) of our working and learning involves technology (think of a job in 2011 that does not use technology), and more specifically a computer device. Think about your cell phone in 2001. What could it do then? What does your smart phone do now? What will it be able to do in 2015? 2016? 2030? 2050? 2083 (when there are 10 billion people in the world)? And our students require access to similar learning tools in school. 3. Therefore and in order for CCS graduates to compete globally for jobs, our schools must demand that our students really think—both orally and in writing—as opposed to merely memorizing and regurgitating. They must develop their own well-reasoned interpretations of pieces of literature and significant events in history; develop and test hypotheses in science classes and explain their thinking about how they solve complex math problems; work in groups to wrestle with and explain their thinking—every day—regarding really big issues facing our world today (paraphrased from The Global Achievement Gap by Tony Wagner, 2008). They must use technology to communicate, create, interact, and dig deeply into really big issues facing our world today, in 2015, 2016, 2030, 2050, and 2083 (when there are 10 billion people in the world). 4. If we believe—and I mean truly believe—that "The future of our economy, the strength of our democracy, and perhaps even the health of the planet's ecosystems depend on educating future generations in ways very different from how many of us were schooled" (Wagner, 2008, p. xxviii); and if we further believe items #1, #2, and #3 above, then it is our responsibility and obligation to ensure that every single student who attends and graduates from the Clarkston Community Schools has the skills and dispositions listed in our district's learner proflie and that he/she uses technology to communicate, create, interact, and dig deeply into really big issues facing our world today, in 2015, 2016, 2030, 2050, and 2083 (when there are 10 billion people in the world). Hence, our learner profile is more than just words on paper, it is a commitment to every single student we serve. I invite you to join me in future discussions of our district's vision, mission, and learner profile. I invite you to join me in doing all that we can together to ensure that every CCS student becomes a thoughtful, contributing member of society who possess the behaviors, skills and attitudes to continue to learn and adapt to a diverse and dynamic global society. That each student is curious and imaginative and exhibits critical thinking and problem solving skills, is an effective oral and written communicator, and can access and analyze information. And each learner, as a successful 21st Century citizen, effectively uses technology. And further that every student nimbly applies these skills throughout life in academic, social, and emotional situations. Let's make this our collective commitment to our students, our teachers and administrators, our support staff, our community, and our future. My life is blessed many times over. I am thankful every day to work and learn in Clarkston. This quote makes me think yet again the discussion that Dr. Rod Rock and I had about intelligence and how we measure it. When we test we are only testing for prior knowledge or what we have taught in most instances. We are not testing for the Five Great minds of the future and creativity. Many of the great thinkers of human civilization did not come strictly from education but instead struggled with it as Albert Einstein. 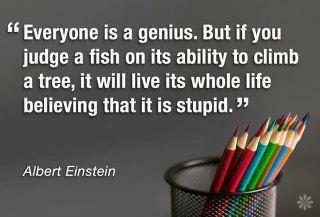 So as we try to fit all children into one box, and test for intelligence in one way. Stop and think about this quote. Dr. Perry is the Founder of Capitol Preparatory Magnet School, best-selling author of "Man Up," and education contributor on CNN. His heart pumps passion for education reform and positive change. Promethean's ActivEngage is perfect for schools embracing the BYOD initiatives. Not only does it give every student in the classroom a voice, but it lets them "speak up" on their own devices, while allowing teachers to instantly assess their progress. Reality and Illusion. What`s what? This link has been removed by a request of the publisher. This has a great impact on education and how we teach our students. Life has become more complex since the moment of the Big Bang creating the universe. Shortly after that moment in time, we seen simple things as hydrogen and helium combined to create more complex structures. Life has exponentially created complex structures that have created every thing we know and an increasing complex set of rules and structures. Edmodo is a social learning platform that allows teachers to post messages, discuss classroom topics, assign and grade classwork, and share content and materials with their students. Dayna Laur, BIE National Faculty, will show you how to use Edmodo to manage projects in your classroom and how to network and exchange ideas with the Project Based Learning Community. Touché proposes a novel Swept Frequency Capacitive Sensing technique that can not only detect a touch event, but also recognize complex configurations of the human hands and body. Such contextual information significantly enhances touch interaction in a broad range of applications, from conventional touchscreens to unique contexts and materials. For example, in our explorations we add touch and gesture sensitivity to the human body and liquids. We demonstrate the rich capabilities of Touché with five example setups from different application domains and conduct experimental studies that show gesture classification accuracies of 99% are achievable with our technology.